Considering An Education was nominated for three Academy Awards last year, it flew a little under the radar. 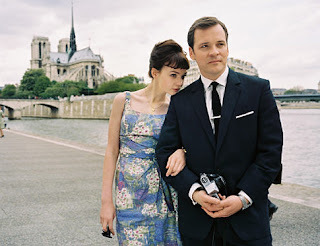 But Peter Sarsgaard and Carey Mulligan turn in a powerful portrait of an older man seducing a 16-year-old school girl in the beatnik-dandy England of 1961. As Mulligan and her parents fall under the seemingly suspicious spell of Sarsgaard's character, viewers begin to feel less creepy about the inappropriate age difference of the couple. The complexity of their relationship draws us in and we forget (at least somewhat) about the political incorrectness (less so, I guess, by the standards of 1961) of what's happening. An Education also has captivating messages about the importance and necessity of both formal academia and "the school of life." Mulligan was nominated for the best actress Oscar and the film itself for best picture. Sarsgaard couldn't quite break through the fierce male competition, but his performance is every bit as great as anyone else's last year. I may be somewhat biased, however, since he grew up a few miles from me (and was born one year later) at Scott Air Force Base near Belleville, Illinois (also former home of Jimmy Connors and Jeff Tweedy). Sarsgaard is putting together quite a resume, with highlight roles in Boys Don't Cry, Shattered Glass, Garden State, Kinsey, and The Mysteries of Pittsburgh.